Mention sleep apnea and images of an older, overweight to obese man with a thick neck and obtrusive snoring come to mind. Rarely do we think of women fitting this profile. But that typical thought pattern of who has sleep apnea and who may not often is not representative of the demographic of sleep apnea sufferers. Even though the older, overweight man is the commonly perceived victim of sleep apnea, more studies are finding that women of all ages and sizes suffer from some form of obstructive sleep apnea, or interruptions in breathing during sleep. Young, healthy, and fit women often don’t get diagnosed because they don’t show the same warning signs. 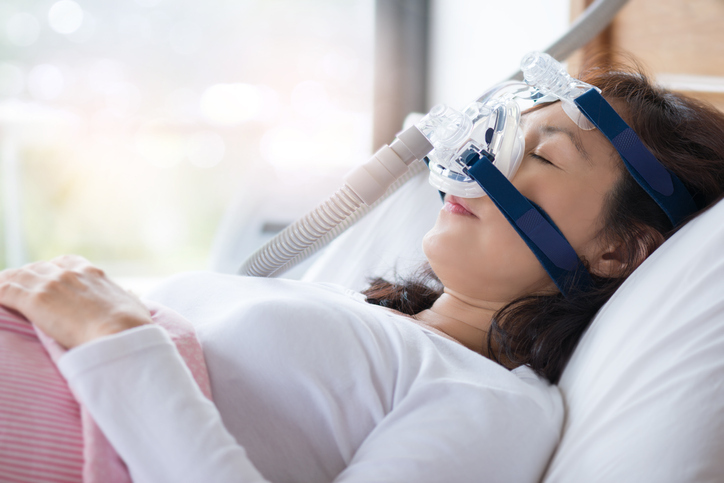 Obstructive sleep apnea (OSA) is a sleep-related breathing disorder in which either the throat muscles collapse, the tongue falls back into the airway, or enlarged tonsils and/or adenoids impede air flow. When your airway becomes cutoff, the brain has to wake itself to signal the respiratory system to kick back into gear. This often leads to breathing resuming with loud gasps, snorts, or body jerks that may wake you from your slumber and disrupt your sleep. Multiple incidences of waking up throughout the night do not allow the mind and body to get the rest they need to function, leaving women tired and drained during the day. According to the American Academy of Sleep Medicine, it is estimated that as many as 26% of adults aged 30-70 years have OSA. Men are twice as likely to have sleep apnea then women. However, men are often diagnosed with sleep apnea almost 8 times more often than women. A 2013 study found that 50 percent of women between 20 and 70 have some degree of sleep interruptions due to disordered breathing caused by OSA, ranging from mild to severe. If women are half as likely to have OSA as men, but are diagnosed and treated for it only an eighth of the time, what’s wrong with this picture? Where does the problem lie – patient reporting, doctor evaluation, varying symptoms, or a combination of all of the above? Part of the reason for under diagnosis of OSA in women may have to do with the misconceptions of who is at risk for OSA. Many women don’t fit the stereotypical body type and don’t always say they are sleepy. Many will say they feel fatigued, leading physicians to think they have insomnia instead of possibly OSA. · Women with OSA tend to be more obese with lower AHI than men – however even petite, slender, and fit women can have OSA. · Women are more likely to be prescribed medications such as antidepressants, rather than a sleep study for further testing. · Men are less likely to be observant to their bed-partner’s sleep disturbances than women. Many men seek treatment for OSA only because of concern of their bed-partner. · Women have a greater risk of developing OSA transitioning into menopause. Women are three times more likely to have post-menopausal sleep apnea than pre-menopausal. Reasons for post-menopausal OSA include weight gain and unclear hormonal changes. · The risk for developing OSA among women with polycystic ovarian syndrome can be as high as 70%. · Pregnancy can increase the risk of developing OSA. Untreated OSA in pregnant women an lead to complications during pregnancy including high blood pressure, enlarged heart, pulmonary blood clots, more frequent preeclampsia, neonatal intensive care unit admissions, and cesarean delivery. Whether a man or woman has OSA, this condition is a significant risk factor for both heart disease and diabetes. The prevalence of hypertension in people with OSA ranges between 30-70 percent and is similar in men and women. However, when taking body mass index (BMI) into consideration, some gender differences emerge; men with OSA who are markedly obese (BMI > 37 kg.m-2) have a two-fold higher risk of hypertension than obese women with OSA. OSA is also associated with an increased with for the development of type 2 diabetes independent of obesity. There is limited research about the modifying effect of gender on this relationship; however, it appears that habitual snoring and self-reported apneic events are associated with increased risk for diabetes. Any woman suspecting her symptoms could be related to OSA needs to speak up and discuss this with her doctor. Improving sleep quality can drastically change their life for the better as adequate, sound sleep is necessary for proper day-to-day functioning. Ask for a referral to a sleep specialist for a sleep study. Only a doctor who specializes in sleep medicine can give a proper diagnosis. The sooner it can happen, the better.